DARK SECRETS: The Maiden Castle (pictured here) is so-called because it is reputed to be linked to tales of imprisoned daughters jumping to their deaths. This lies 212 metres above the Morava and Danube Rivers. MAN OF WAR: Here I am trying out one of the old weapons that were used in ancient times at a living history exhibition taking place at the castle. CUTTING EDGE: This gentleman was showing numerous young people and visitors alike the weapons of the day and how they were used. ROYAL FORTRESS: Corfe Castle is a natural hill that dominates the Purbeck Hills and was the scene of a major siege during the English Civil War. 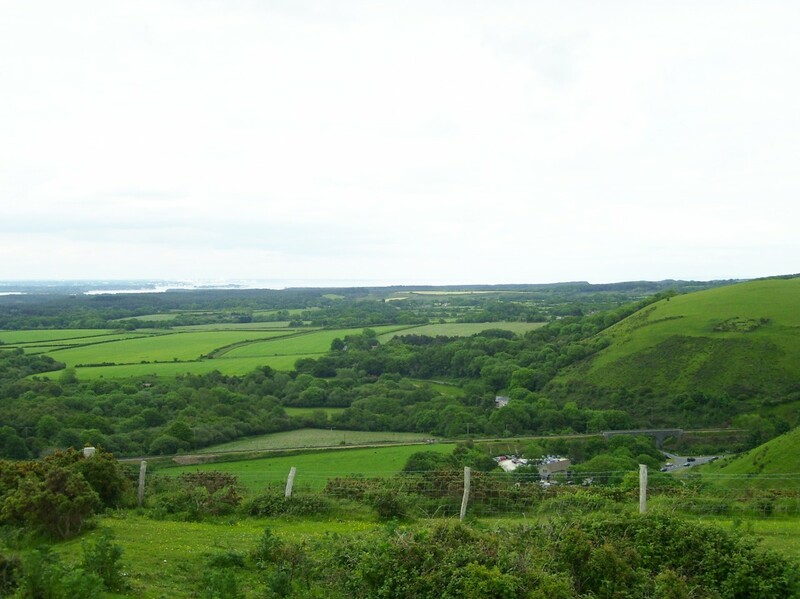 ICONIC VIEW: This is a view across the Purbecks from the ridge overlooking Corfe Castle. CASTLES in Dorset and south east Slovakia have comparable stories when looking back into their past. 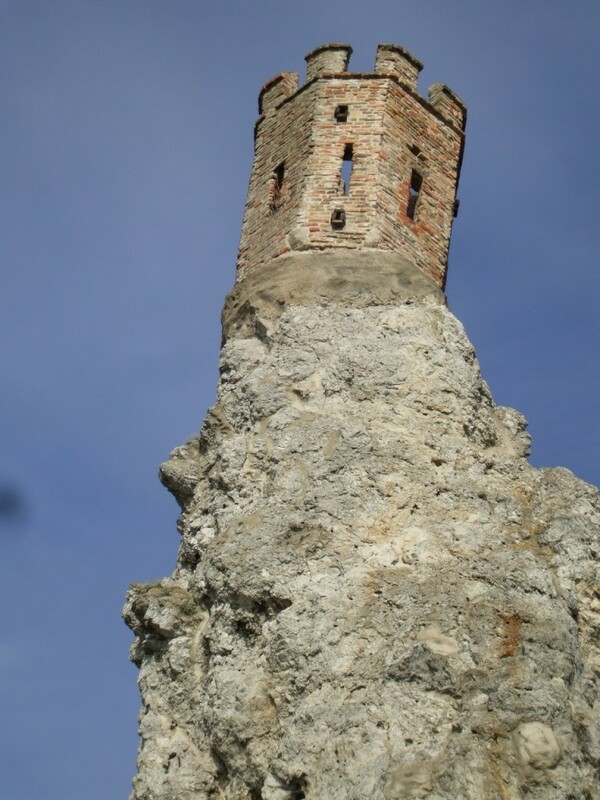 Devin Castle is strategically placed and lies 212 metres above where the rivers Danube and Morava merge. Its owner had control of the trade route along the Danube and at least one branch of the Amber Road. The castle stands just inside Slovakian territory and looks across to Austria. It was once what separated the Communist Eastern bloc and democratic western Europe. It was formerly regarded as the gateway to the old kingdom of Hungary. Before the Velvet Revolution, the castle was open but it was in a militarized zone and heavily fortified with watchtowers and barbed wire. It was demilitarized in 1989. Devin Castle’s most well known part is the Maiden Tower. Standing perilously on a stack of rock, it is so-called because of countless stories of imprisoned lovesick daughters leaping to their deaths. Goats are used to keep the grass under control on the steep slopes and at Corfe a flock of Swaledale and Soay sheep are used in the same way. The main part of the castle that is open to the public is has a mass of staircases, walls, open courtyards and gardens in a variety of states of repair. 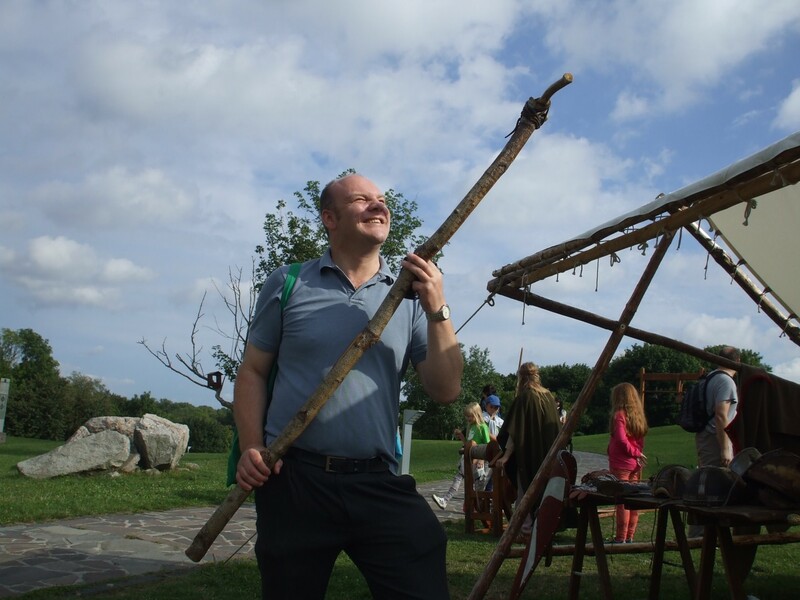 On my visit to Devin Castle in August a living history exhibition caught my attention and I couldn’t resist the opportunity to try out one of the ancient weapons the original inhabitants would have used. The thought of what these weapons could actually do to someone physically temporarily turned my stomach. When Slovakia was punching above its weight, the castle was a major seat of the Greater Moravian empire. The patron Christian saints of Slovakia, Cyril and Methodius, landed at Devin Castle to begin their missionary work in 863. Some parts of the castle have been reconstructed in the 20th Century and it boasts an interesting museum. Recent archaeological digs have found the castle was previously a base for the Romans and before that a prehistoric settlement. 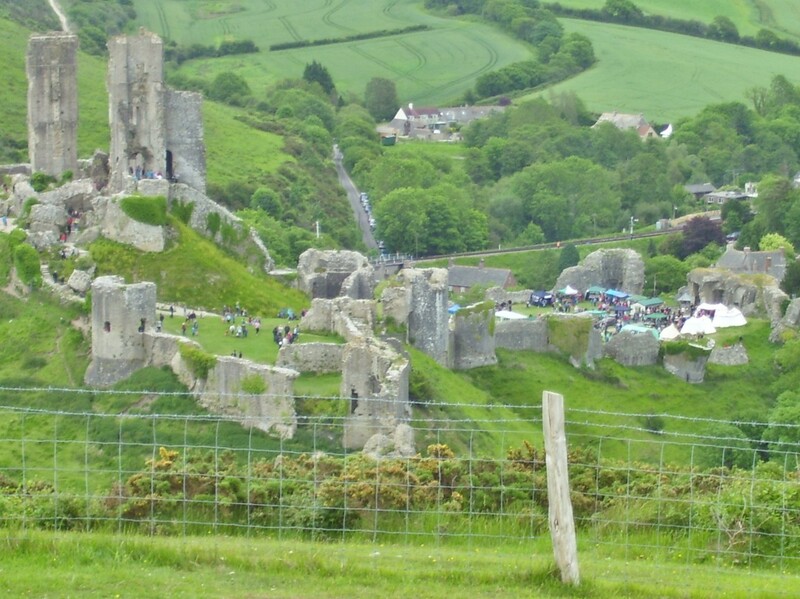 Corfe Castle’s ruins stand as a natural hill guarding the principal route through the Purbeck Hills. The castle also has a much a colourful history as Devin Castle. It is said to have had a Roman fortification on it and the first castle buildings would have been made of wood. Legend says that in 979 King Edward was assassinated by his stepmother so that her son Ethelred the Unready could become King of England. In the latter part of the 11th Century the castle was rebuilt out of stone by William the Conqueror and for the next 600 years was used as a royal fortress by generations of monarchs. Queen Elizabeth I’s dancing master Sir Christopher Hatton was sold Corfe Castle in 1572 and then sold on to Lord Chief Justice Sir John Bankes as an occasional private residence in 1635. The castle got caught up in the English Civil War of the 1640s between the Roundheads and the Cavaliers. It was involved in a six-week siege that was led by the Bankes family and their supporters. Sir John died in 1644 and the castle endured a series of further blockades by Parliamentary forces. Late in 1645 Colonel Bingham of Poole started a second siege and treachery within the castle’s garrison allowed a parliamentary force to overrun the castle in February of the following year. The Roundheads allowed the family to leave the castle and then it was systematically destroyed. In the past week there has been an English civil war re-enactment event called Besieged and Betrayed. 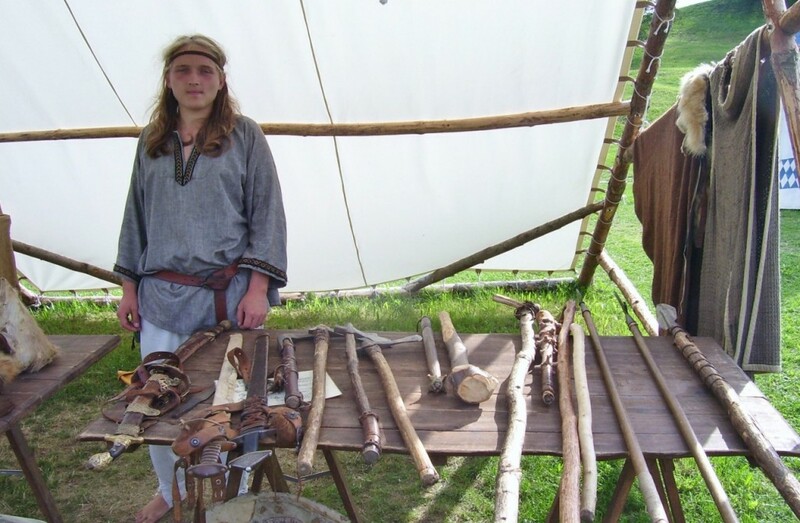 Characters fire muskets and try traditional skills of the age. Sir John’s son Sir Ralph managed to retrieve much of the plundered possessions and give them a new home at Kingston Lacy House near Wimborne. The castle remains under the ownership of the Bankes family until 1982 when it passed over by Mr H J R Bankes to the National Trust as part of the Corfe Castle and Kingston Lacy estate. The castle is home to jackdaws and ravens and legend also says Corfe’s troubles stemmed from the ravens allegedly not being there during the time of the Civil War. The Civil War, the castle has seen its fair share of battles, mysteries and plots and as well as a royal residence and personal home, it has also been a military garrison and a treasury. The plants that thrive on the steep banks attract a number of species of butterfly and the rich chalkland habitat is home to the pyramid orchid. The castle remains one of the National Trust’s most popular venues in Dorset and Somerset.